There is significant disagreement over the number of true rose species. Some species are so similar that they could easily be considered variations of a single species, while other species show enough variation that they could easily be considered to be different species. Lists of rose species usually show more than 360. Hulthemia (formerly Simplicifoliae, meaning "with single leaves") containing one or two species from southwest Asia, R. persica and R.berberifolia (syn. R. persica var. berberifolia) which are the only roses without compound leaves or stipules. Hesperrhodos (from the Greek for "western rose") has two species, both from southwestern North America. These are R. minutifolia and R. stellata. Platyrhodon (from the Greek for "flaky rose", referring to flaky bark) with one species from east Asia, R. roxburghii. 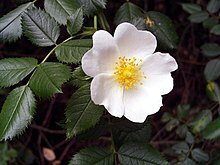 Rosa farreri Stapf ex Cox – Farrer's "Threepenny-bit Rose"
Wikimedia Commons has media related to Rosa. ^ "Rosa". The Plant List. Version 1.1. 2013. Retrieved 2016-09-17. This page was last edited on 8 March 2019, at 19:11 (UTC).